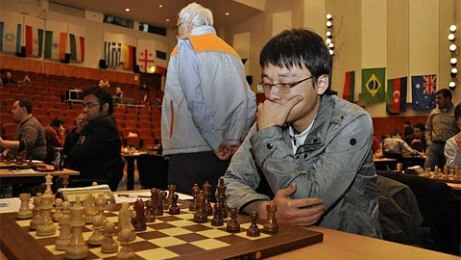 Chinese Grandmaster Zhou Weiqi has won the Premier section of the 2015 Doeberl Cup after concluding the event with 7,5/9 points. He could even afford a last round loss, having amassed a big lead earlier in the tournament. The 2015 O2C Doeberl Cup took take place from 2-6th April at the University House, 1 Balmain Cres, in Canberra, Australia. The Doeberl Cup is the longest running weekend chess event in Australia, taking place every year since 1963. The event consisted of four sections: Premier, Major, Minor and Games Capital U1200s. The main Premier section had 70 players from nine countries, including 8 Grandmasters and 13 International Masters. Chief Arbiter was IA Shaun Press.